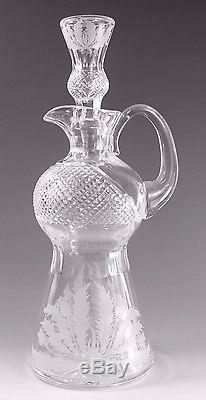 Single Edinburgh Crystal claret wine decanter in the "Thistle" cut. Please note that this is a later version, so the thistles are first etched then cut. 8 thistles'leaves', with 3 prong central leaf. Please see above for quantity available. Signed to the base "Edinburgh Crystal". Item is in excellent condition - used. Some light signs of wear, which may be visible to the underside / base. We're often asked to send glass and cutlery to friends and relatives as a replacement for small accidents... Please let us know if you would like us to send the receipt somewhere else! Sadly we are unable to accept customer collections at this point. All items are cleaned and inspected before being dispatched; we only use the best packing materials to insure your item reaches you safely. The item "EDINBURGH Crystal THISTLE Cut Claret Wine Decanter Recent Cutting (1st)" is in sale since Tuesday, July 11, 2017. 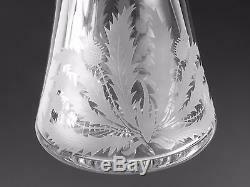 This item is in the category "Pottery, Porcelain & Glass\Glass\Crystal/ Cut Glass\Edinburgh Crystal". The seller is "merrittrobinson" and is located in Bexley. This item can be shipped to North, South, or Latin America, all countries in Europe.